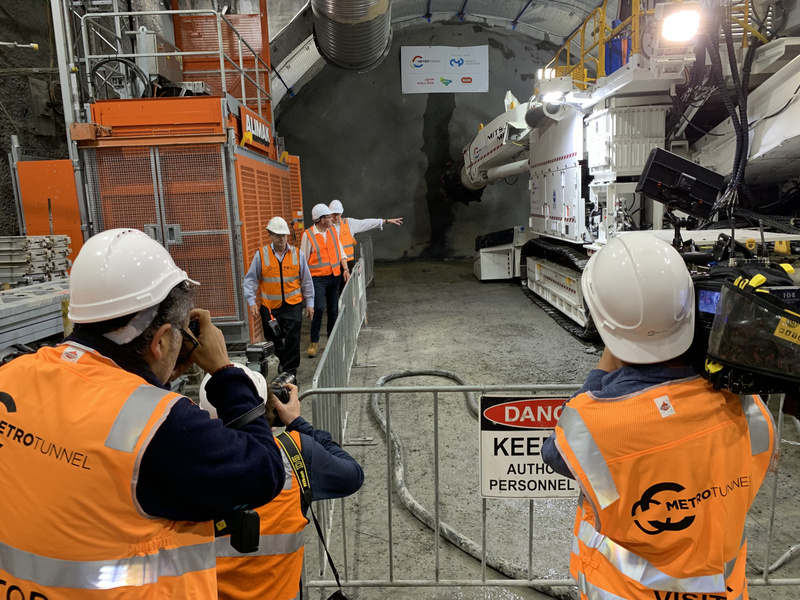 Major construction on one of the Metro Tunnel's CBD stations has begun with the newly re-elected Premier joining Metro Tunnel boss Evan Tattersall inspecting the equipment that's set to get the job done in the CBD. The parts of the machine were lowered 30 metres underground through the access shafts that have been built underneath the acoustic sheds that adorn the area around the state library station. Reassembled underground, the road header machines are set to mine their way through the rock underneath the CBD to create the access points and overall cavern for the State Library station that will connect with Melbourne Central station. According to the state government, 6 machines in total will be used for both CBD stations - State Library and Town Hall that will connect to Flinders Street - with the second and third machine set to begin work on the State Library station site next year. Approximately 1,500 tonnes of rock will be mined per day once all three machines are operating that will yield the equivalent of 70 Olympic-sized swimming pools worth of spoil upon completion of construction. The same machines will build the shorter stretch of tunnel between both stations while the rest of the tunneling both north and south of the CBD stations will use Tunnel Boring Machines. Cut and cover 'station pits' are currently under construction at Anzac, Parkville and North Melbourne (née Arden). Two TBMs will be launched from North Melbourne station heading westwards first to the tunnel entrance, disassembled, brought back to North Melbourne station and then reassembled and set off in an easterly direction toward Parkville station. At Parkville, the TBMs will be dragged through the station pit and then set off southwards to State Library station. Two more TBMs will be launched from Anzac station firstly heading south-easterly to the eastern tunnel entrance and like at the western tunnel entrance, the TBMs will be disassembled, brought back to Anzac station and then set off in a northerly direction under the Yarra to Town Hall station.